Authors Words | Writers Unite! Henry David Thoreau (baptized David Henry Thoreau) was born on July 12, 1817 in Concord, Massachusetts, to John Thoreau and Cynthia Dunbar. He was the third of four children. He was named after a recently deceased paternal uncle, David Thoreau, but since everyone always called him Henry, he eventually changed his name to Henry David, although he never petitioned to make a legal name change. Henry’s father was a businessman and active in the Concord Fire Society. His mother spent her time raising Henry and his three siblings, Helen, John and Sophia. When Thoreau was sixteen, he entered Harvard College, where he was known as a serious though unconventional scholar. Henry’s older siblings, Helen and John, Jr., were both schoolteachers. When it was decided that their brother should go to Harvard, as had his grandfather before him, they contributed from their teaching salaries to help pay his expenses. While at college, Thoreau studied Latin and Greek grammar and composition, and took classes in a wide variety of subjects, including mathematics, English, history, philosophy, and four different modern languages. During his Harvard years he was exposed to the writings of Ralph Waldo Emerson, who later became his chief mentor and friend. After graduating in 1837 and into the early 1840s Thoreau was occupied as a schoolteacher and tutor. A canoe trip in 1839 convinced him that he should not persue a schoolteacher’s career but should instead aim to become established as a poet of nature. In 1841 he was invited to live in the Emerson household, where he remained intermittently until 1843. He served as handyman and assistant to Emerson, helping to edit and contributing poetry and prose to the transcendentalist magazine, The Dial. 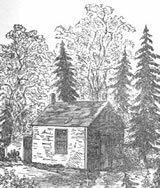 Thoreau came to consider that he needed time and space to apply himself as a writer and on July 4, 1845, he moved into a small self-built house in a second-growth forest around the shores of Walden Pond. He stayed there for two years, two months and two days, sometimes traveling into Concord for supplies and eating with his family about once a week. Friends and family also visited him at his cabin, where he spent nearly every night. While at Walden, Thoreau did an incredible amount of reading and writing, and also spent much time sauntering in nature. In July 1846, when Thoreau went into town to have a pair of shoes repaired, he was arrested for refusing to pay a poll tax meant to support America’s war in Mexico. He spent a night in jail. His most famous essay, Civil Disobedience (published 1849), which in its call for passive resistance to unjust laws was to inspire Gandhi and Martin Luther King, Jr., was a result of this experience. The journal he kept at Walden became the source of his most famous book, Walden, Or Life in the Woods (1854), in which he set forth his ideas on how an individual should best live to be attuned to his own nature as well as to nature itself. Thoreau left Walden Pond on September 6, 1847. After that, he resided again in Emerson’s house (1847–49) and then for the rest of his life in his family home. He occasionally worked at the pencil factory and did some surveying work. He also traveled to Canada, Cape Cod, and Maine – landscapes that inspired his “excursion” books – A Yankee in Canada, Cape Cod, and The Maine Woods. By the 1850s he had become greatly concerned over slavery, and, having met John Brown in 1857, wrote passionately in his defence. Aware that he was dying of tuberculosis, Thoreau cut short his travels and returned to Concord, where he prepared some of his journals for publication. Although he never earned a substantial living by his writings, his works fill 20 volumes. 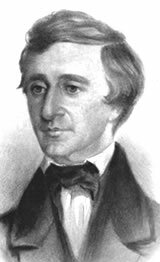 Thoreau died of tuberculosis on May 6, 1862, at the age of 44. He is buried on Authors’ Ridge in Sleepy Hollow Cemetery in Concord, Massachusetts. Dickens’s A Christmas Carol has become an iconic fixture in our celebration of the holiday. Everyone has their favorite movie version of this story of goodwill to all men and redemption for one man. However, to read the novel is to experience the true depth of character and spirit that Dickens intended. Charles Dickens, in full Charles John Huffam Dickens, (born February 7, 1812, Portsmouth, Hampshire, England—died June 9, 1870, Gad’s Hill, near Chatham, Kent), English novelist, generally considered the greatest of the Victorian era. His many volumes include such works as A Christmas Carol, David Copperfield, Bleak House, A Tale of Two Cities, Great Expectations, and Our Mutual Friend. Dickens enjoyed a wider popularity during his lifetime than had any previous author. Much in his work could appeal to the simple and the sophisticated, to the poor and to the queen, and technological developments as well as the qualities of his work enabled his fame to spread worldwide very quickly. His long career saw fluctuations in the reception and sales of individual novels, but none of them was negligible or uncharacteristic or disregarded, and, though he is now admired for aspects and phases of his work that were given less weight by his contemporaries, his popularity has never ceased. The most abundantly comic of English authors, he was much more than a great entertainer. The range, compassion, and intelligence of his apprehension of his society and its shortcomings enriched his novels and made him both one of the great forces in 19th-century literature and an influential spokesman of the conscience of his age. Born in New York City on December 28, 1922, Stan Lee went on to work for the company that would eventually become Marvel Comics. With artist Jack Kirby, Lee launched the superhero team the Fantastic Four in 1961, and was soon responsible for creating popular characters like Spider-Man, the X-Men, the Hulk and Thor. Lee later worked in a number of comic-related business and multimedia ventures. Stanley Martin Lieber was born on December 28, 1922, in New York City to Romanian immigrants Celia and Jack Lieber. With part of his childhood spent during the Great Depression, Lieber and his younger brother, Larry, watched his parents struggle to make ends meet for the family. Lieber, who later shortened his name to “Lee” as a writer, went on to be hired as an office assistant at Timely Comics in 1939 and became an interim editor for the company in the early 1940s. Lee also served domestically in the Army during World War II, working as a writer and illustrator. In the early ’60s, Lee was called upon by his boss to create a series for Marvel Comics(Timely’s new name) that could compete with rival DC Comics’ hit title Justice League of America. Citing writing influences like Sir Arthur Conan Doyle and Jules Verne, and following the encouragement of his wife, Joan, Lee did away with some of the usual superhero conventions. Hence, with artist and co-creator Jack Kirby, the Fantastic Four was born in 1961. Following the success of the Fantastic Four, a slew of new characters soon sprung from Lee and his Marvel cohorts, including the Hulk, Spider-Man, Doctor Strange, Daredevil and the X-Men. Marvel Comics became a highly popular franchise, and Stan Lee was promoted to editorial director and publisher in 1972. He later moved to the West Coast to be involved in Marvel’s film ventures and eventually became chairman emeritus. Lee has become involved in a variety of multimedia projects while also serving as an ambassador for Marvel, even though he has filed lawsuits against the company and been the subject of debate over appropriate compensation for comic creators. The writer has seen Marvel develop into an entity that has inspired blockbuster film entertainment like the Iron Man, X-Men, Thor and The Avengers franchises. Lee started intellectual-property company POW! Entertainment in 2001 and the following year published his autobiography, Excelsior! The Amazing Life of Stan Lee. Later in the decade he received a Medal of Arts honor from President George W. Bush and launched the History Channel show Stan Lee’s Superhumans, a series that looked at people with remarkable skills and abilities. 2012 saw more new ventures. Lee co-wrote a graphic novel, Romeo and Juliet: The War, which landed on The New York Times‘ best-seller list and launched a YouTube channel, Stan Lee’s World of Heroes, which features comic, comedy and sci-fi content. At the end of the year, the ever-active Lee turned 90. Lee endured the loss of his wife of nearly 70 years, Joan, in July 2017. He then gave fans a scare when he checked into a hospital for an irregular heartbeat and shortness of breath the following January. However, the comic book titan was discharged shortly afterward, and announced he was ready to resume a full schedule with the latest Marvel feature, Black Panther, soon to be released. Although things seemed to be humming along nicely for Lee and the Marvel universe, an April 2018 feature in The Hollywood Reporter painted a far different story. According to the publication, Lee’s daughter J.C. and other insiders were engaged in a battle over care of the 95-year-old and the future of his estate, the sides pitting Lee against one another and inducing him to dismiss formerly trusted associates. The piece also described J.C.’s tempestuous relationship with Lee, including an incident in which she physically assaulted both of her elderly parents. Lee died on November 12, 2018 in Los Angeles, California. Hunter S. Thompson was born in Louisville, Kentucky, in 1937. He showed a knack for writing at a young age, and after high school began his career in journalism while serving in the United States Air Force. Following his military service, Thompson traveled the country to cover a wide array of topics for numerous magazines and developed an immersive, highly personal style of reporting that would become known as “Gonzo journalism.” He would employ the style in the 1972 book for which he is best known, Fear and Loathing in Las Vegas, which was an instant and lasting success. For the remainder of his life, Thompson’s hard-driving lifestyle—which included the steady use of illicit drugs and an ongoing love affair with firearms—and his relentlessly antiauthoritarian work made him a perpetual counterculture icon. However, his fondness for substances also contributed to several bouts of poor health, and in 2005 Thompson committed suicide at the age of 67. While this is very true for writers, it is also true in life.